Diwali and Govardhan Puja this Week! ~ The Toronto Hare Krishna Temple! Diwali and Govardhan Puja this Week! This week will certainly be a special one at Toronto's Hare Krishna temple! On Thursday, October 27th, we will be celebrating Govardhan Puja and on the following Sunday, October 30th, we will celebrate Diwali (actual date for Diwali is Wednesday, October 26th)! 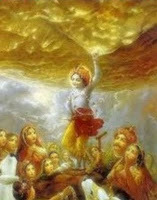 The story of Diwali stems back to ancient times when inhabitants of Ayodhya celebrated the return of Lord Ramachandra. Lord Rama was in exile, away from His kingdom, for many years. The joyful day on which He finally returned is observed as Diwali, or Dipavali (“dipa” means candles, and “vali” means numerous.). We will be celebrating this festival on Sunday during the Sunday Feast. The day after Diwali is referred to as Annakuta, or Govardhana Puja. 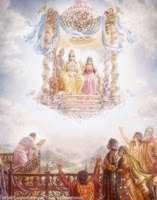 On this day the inhabitants of Vrindavan (Lord Krishna’s abode on Earth) would hold a harvest festival in honour of King Indra, the demigod who provided the rains essential for the harvest. One day, however, Lord Krishna wanted to teach Indra a lesson. He convinced the inhabitants of Vrindavan to honor Govardhana Hill instead, whose fertile soil provided the grass upon which the cows and bulls grazed, and to honour the cows and bulls who provided milk and ploughed the lands. Govardhan Puja celebrations at the Hare Krishna temple have always been popular and this year will also feature a grand "Govardhana Hill" made entirely of sweets in the middle of the temple room! Please join us for festivities from 6:00pm onwards to celebrate this festival! We hope to see you and your family at the Hare Krishna temple this week!